Why are we so happy for the Torah specifically at Simchat Torah? 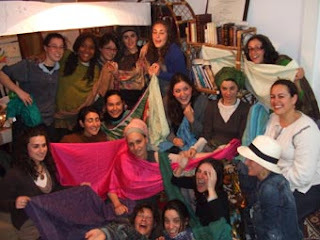 There must be a deeper reason behind the profound joy expressed through the singing and dancing with the Torah than the mere completion of the cycle of weekly Torah readings? Rav Refael Luria explains that Tishrei is the month of teshuvah when we return to our source. Our true source is the Torah preceding even the creation of the world (Pesachim 54a). 1) Receiving the Ten Commandments orally on Shavuot. 1) Rosh Hashana rectifies the sixth of Sivan- the giving of the Ten Commandments; the blowing of the shofar connects these two events. 2) Yom Kippur when we received the second tablets rectifies the seventeenth of Tamuz when the first tablets were shattered. Simchat Torah completes Shavuot as love of G-d completes fear of G-d. Both are called Atzeret- meaning the conclusion of the previous holiday. Shavuot concludes Pesach, while Simchat Torah concludes Sukkot. On Pesach Hashem redeemed us from physical slavery, whereas on Sukkot we attained spiritual freedom by means of our repentance on Yom Kippur. The freedom of the body associated with Pesach culminates in receiving the Torah on Shavuot with trembling and fear of G-d through thunder and lightening. Yet, the freedom of the soul attained on Sukkot culminates in joyous dance on Simchat Torah when we receive Torah through love. On Shavuot we received the gift of Torah from Above, without having to work for it. Because we had not integrated the Torah, we did not understand how wrong it was to produce the Golden Calf. After receiving the Torah through our own efforts, the sin of the Golden Calf could never have occurred. Therefore, Simchat Torah, when we have worked to deserve the Torah through our teshuvah during the month of Tishrei, is a tikun (rectification) for the sin of the Golden Calf. Each step of our joyous dancing surrounding the Torah rectifies another aspect of the Israelite’s dancing around the Golden Calf. All the holidays of Tishrei culminate with Simchat Torah because our relationship with the Torah is the purpose of the entire month. Every Simchat Torah forgiveness rains down on Israel as a result of the rectification for Moshe’s breaking of the Tablets when seeing the Golden Calf. Receiving rain in the Land of Israel is a result of our complete forgiveness as Rabbi Tanchum Bar Chanilay said, “The rain only falls when Israel’s sins are forgiven” (Ta’anit 7b). Now we understand why we begin to pray for rain in the Land of Israel on Simchat Torah. Hashem wanted the rain to be dependant on our efforts – after having worked so hard on ourselves to return to our true essence – we now deserve the gift of rain and sustenance. On Simchat Torah in addition to celebrating the completion of the cycle of weekly Torah readings, we celebrate the rectification for the Golden Calf and G-d’s forgiveness of Israel. No wonder this holiday is the most joyous of the year.